Purple Depression glass is one of the more unusual colors of this popular collectible. Collectors love it for its rich purple tones from amethyst to deep purple. Some collectors identify the purple glass as amethyst; the terms can be used interchangeably. Depression glass can be clear or colored in a variety of hues. It was given away by companies during the Depression as incentives for doing business with them. Food manufacturers like Quaker Oats would place a piece of the glassware in each container of food to encourage consumers to continue to buy the products. Some of the glass was sold at a very low cost at local five and dime stores. While some colors like pink, green, and amber are quite common, others are less so. The rare colors include delphite, cobalt blue, black, and purple. Some manufacturers have released reproductions of the glassware, so it is important that the collector be very careful when purchasing. There were a few companies that made purple Depression glass in a limited number of patterns. The purple color was created by the addition of nickel or manganese to the glass mixture during manufacturing. The following are some of the more unusual patterns that were made in purple. Dell made the Tulip pattern in the 1930s. The most popular and collectible color is the purple. Hazel Atlas was well known for all of their glass products including Mason jars. Several of their patterns came in purple. New Century was released in 1930. Although somewhat rare this pattern is not too expensive and comes in a deep purple color. Royal Lace was introduced in 1934, with a few pieces made in purple. Newport Hairpin design was made in cobalt blue, amethyst, and pink. It was released in 1936. The Sweet Pear pattern was released in 1923 in pink, green, and clear. Indiana Glass made the pattern in purple as well; however, this was not done until the 1970s, so technically it is not considered Depression glass. The L.E.Smith Glass Company released Mt. Pleasant Depression Glass in the 1920s in several colors. The most popular amongst collectors is the amethyst, black, and cobalt blue. The New Martinsville Glass Company manufactured a very Art Deco designed Depression glass that they called Moondrops. The pieces were sleek with a clean, stylized look and were introduced in 1932. Among the colors that it came in was purple. Although Depression glass is very popular and found at almost every antique shop it can be difficult to find certain colors and patterns. Shopping online may greatly speed the process, just be careful to ask questions and understand what you are buying. All Antique Glass has a variety of glass from Carnival to Depression. There are images and descriptions of each item. Ruby Lane is an antique mall with hundreds of shops. You can find almost anything if you just keep checking back. Descriptions and images are generally excellent quality. Strait's Antiques carries vintage and antique glass in a number of patterns and colors. It is located in Chambersburg, Pa. but you can easily shop their online catalog. Tias is an online antique mall. With all of the available shops you are bound to find some purple glass. Don't forget to keep checking local venues such as antique stores and flea markets. 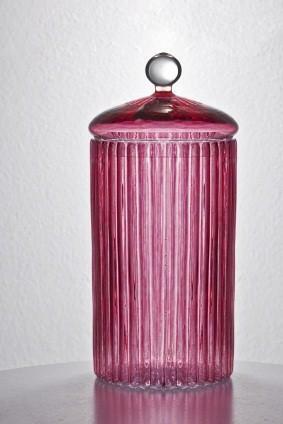 Because the purple glass tends to be dark it is a good idea to display it against a light background. This shows of the beautiful colors of the glass. Adding purple Depression glass to your collection may be challenging, but ultimately you will have an unusual collectible that may increases in value over time.